This article is about the gameplay area. For the special fields used for the WDC tournament, see Duel Field. For the Spell Card property, see Field Spell Card. The field (フィールド Fīrudo) is the area where Duelists place their cards. Game Mats (or playmats) are often used as field. The field is divided into two halves, one for each player, with each half having 5 Main Monster Zones, 5 Spell & Trap Zones (including 2 Pendulum Zones), a Field Zone, a Deck Zone, an Extra Deck Zone, and a Graveyard. In the middle of the field, there are 2 Extra Monster Zones, which do not belong to either player while unoccupied. The "field" referenced by card text is the combination of each player's Monster Zones, Spell & Trap Zones, Pendulum Zones and Field Zone. Thus, the field is shared and each player controls only one side of it. The field is also unofficially referred to as the board. The top left Zone is the Field Card Zone. The top right Zone is the Graveyard. The top 5 Zones in the middle are the Monster Card Zones. The bottom left Zone is the Extra Deck Zone (originally known as the Fusion Deck Zone). The bottom right Zone is the Deck Zone. 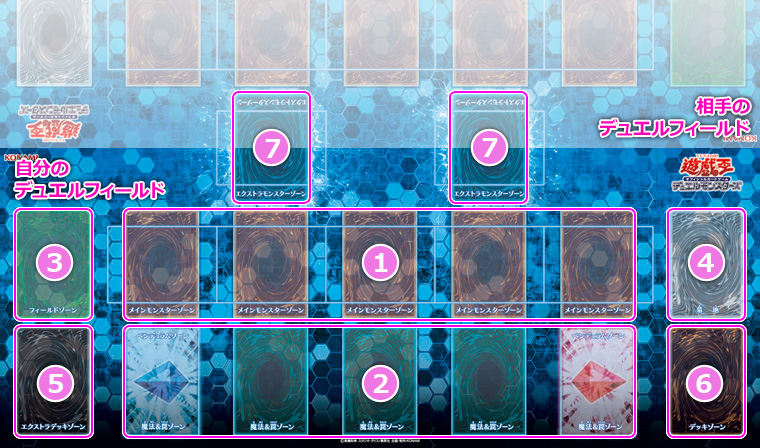 The bottom 5 Zones in the middle are the Spell & Trap Card Zones (originally known as the Magic & Trap Card Zones). Conceptually, there is an additional space sometimes referred to as the Banished Zone. However, it is never represented on official playmats, since it is not actually a Zone. Most video games place banished cards in a pile the right of the Graveyard. The top left Zone is the Field Zone. The top 5 Zones in the middle are the Monster Zones. The bottom left Zone is the Extra Deck Zone. The bottom 5 Zones in the middle are the Spell & Trap Zones. The blue-colored Zone and the red-colored Zone are the Pendulum Zones. The right Pendulum Zone is located between the Deck Zone and Graveyard Zone; the left Pendulum Zone is located between the Extra Deck Zone and the Field Zone. The top 2 half-Zones are the Extra Monster Zones. These are shared between both players; when two players both have game mats, they form complete Zones like the other Zones on the mat. The upper 5 Zones in the middle are the Main Monster Zones. The far left Spell & Trap Zone (blue-colored) and the far right Spell & Trap Zone (red-colored) are also Pendulum Zones. However, they are only treated as Pendulum Zones while they are occupied by a Pendulum Monster. This page was last edited on 4 October 2017, at 03:28.